Mea culpa. I didn’t mean it. It’s impossible. It can’t be done. I'm a true disbeliever. 1) Treat Joe Mauer’s remaining at-bats as essentially random events. 2) The chance of a hit happening during those events is based on Mauer’s "true talent level," which he determines to be that of a .318 hitter. 3) Estimate how many at-bats he’ll have the rest or the season, which he determines to be about 420 at-bats. 4) Use a cool Excel function (BINOMDIST for you fellow geeks out there) to determine the chance that enough hits happen to reach a .400 batting average at the end of the season. There are a lot of assumptions there, and so the exercise ends up being useful in a look-how-I-can-model-the-un-model-able kinda way, meaning it’s for fun only. It might not be used that way, but I’m pretty sure that’s what it’s meant for. And he concludes that Mauer has a .0267% chance. So what can you take away from it? 1. BINOMDIST. I love this function. I’m going to use it silly. 3. I wondered what this little exercise would look like if I evaluated Tony Gwynn’s chances of hitting .394 in 419 at-bats, like he did in 1994. I took his true talent level to be a .338 hitter, since that’s what he was over the course of his career. 4. Seidman concludes his results paragraph with one of the greatest movie quotes of all time: "So you’re saying there’s a chance." Beautiful. We should probably all keep that in mind when referring to this .400 thing. Even if it’s possible, it’s unlikely. Of course, that’s what would make it so great. That was kind of fun, but the post that blew me away was at a rarely posted Twins blog called Away Games, authored by someone nicknamed Chiasmus. I’m going to summarize it a little, but I hate to do so, because I would really rather you just click through. It’s comprehensive, using statistical methods and data that made my jaw drop, but the author manages to hide all that stuff and write the results in a simple, fun, self-deprecating style. This is exactly the sort of treasures that the internet is supposed to produce. The author cites a study from 1986 by Stephen Jay Gould that argues that the reason it is harder to hit .400 is that baseball has improved to the point where batting averages are becoming less variable. It’s harder to have outliers of any kind, be it low or high. That’s why players don’t hit .400 any more. Except that Chiasmus carries it a step further, continuing Gould’s study past 1986 into the steroid era. That’s where he finds some surprising results. First, that batting averages have gone up since then, which means it’s a little easier to hit .400. But he also finds out that batting averages also have become slightly more variable since then, meaning an outlier has an easier time stretching from the herd. He then uses the method above on grander scale, determining the chances that MLB produces a .400 hitter in any given year. And that also has some surprising results, and I’m not going to share them, because I really want you to click over. Honestly, how many links do I need to give you people? What do his findings mean for Mauer? It means he’s too young, should’ve come around about 10 years earlier, and that MLB has almost no chance of fielding a .400 hitter this year. So there you have it. 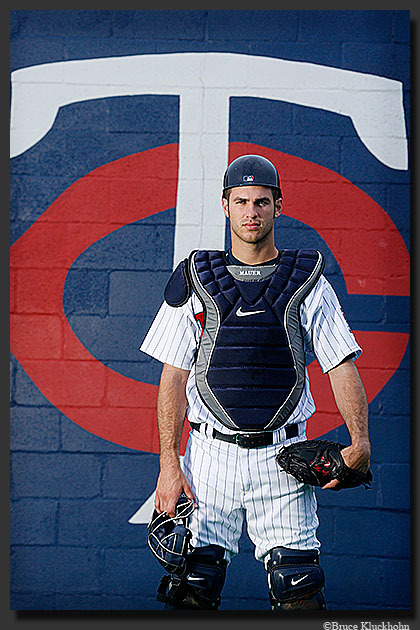 Mauer, and all of MLB is doomed. It’s impossible. It can’t be done. Wow, thanks for all the kind words! I am definitely going to have to start posting more often. I think the biggest problem facing new era hitters is specialization. Ted Williams usually faced the same pitcher through all 9. I wonder, if someone did an analysis of hits per inning and looked at the distribution. Did Ted get more of his hits after the 6th inning? It is amazing watching games and see a manager bring a pitcher in for 1 inning. Starters barely last 5 innings as hitters are instructed to take pitches. I guess it is all relative, but it is fun. GO TWINS!